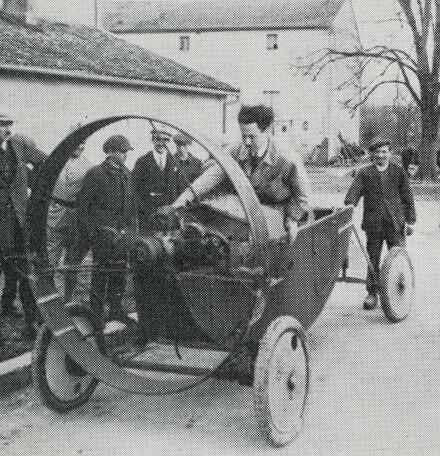 A 1925 photograph of the 1921 Leyat propeller-driven car with ABC engine. For a light car, the A.B.C. offered a surprising number of special coachwork styles. 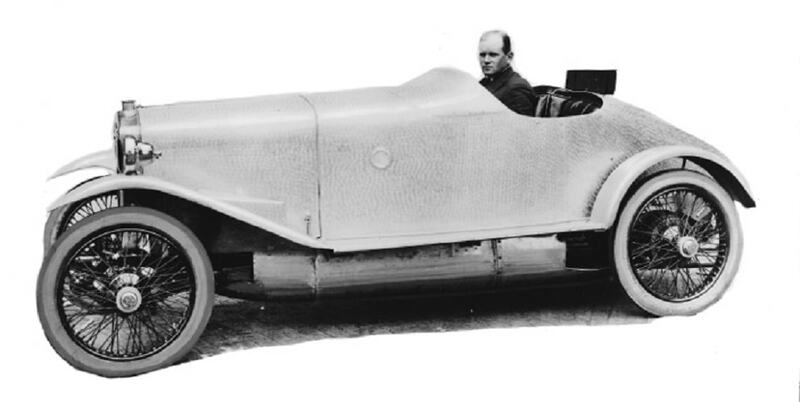 Gordon Watney did an improved Standard model with twin spare wheels and extra weather equipment; George England offered a four-seater, access to the rear being through a hinged front seat; and Morgan & Co. Ltd., of Leighton Buzzard, made a clover-leaf three-seater for the British Motor Trading Corporation, finished in black and cream. George England later introduced an improved two-seater model incorporating special valve springs, push-rod return springs, and lubricated valve rockers, all learnt from Brooklands racing, and a two-bladed timber fan, later added to normal A.B.C. specification. A very pleasant sports body was fitted with vee screen and outside exhaust pipes, but it is doubtful if many were sold at £450 a time. Nineteen twenty two was a comparatively good year for sales with some 750-800 being sold, but since the anticipated output was 5000 cars per year, the Company was getting deeper and deeper in debt. This was reflected by the fact that J H Bean and H J Whitcombe resigned from the board in April 1921, Ernest Noel in December 1921, Maurice Yorke in April 1922, and in July 1922 Capt. Charteris, founder of the Company in 1910. 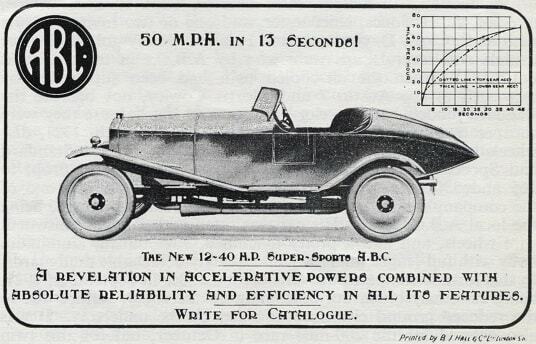 There had been two entries by the Company in the Royal Scottish Automobile Club’s Light Car Trial from 5th-10th June 1922, but these were scratched before the event. A receiver was appointed in November. Little modification took place during the year which was hardly surprising other than to rectify minor quibbles that customers had, although a four seat tourer was available even though few are likely to have been made (the late Bill Boddy of Motor Sport had one of them as his first road transport). Production relied upon the number of engines being completed and this rose from two per week early in 1921, to eight per week by the latter part of 1922. When tested at the factory, the balance weights on the crankshaft removed small pieces of the cast-iron piston, and, after the test, the engine was stripped down, washed out, reassembled and passed on to the next section, where it was bolted to the chassis. Some difficulty was experienced with the hardening of some of the earlier crankshafts, and several complaints were received of the rollers in the big-end bearing biting into the crank and seizing up the engine. To remove the cylinders it was just possible to insert a hacksaw blade between the crankcase and the bottom of the cylinder, and saw through the con-rod. Push-rod throwing epidemics also seemed fairly common practice on A.B.C.s, but was probably caused by insufficient lubrication of the rocker gear, to some extent, by their owners. To rectify the latter complaint, various kits could be obtained to enclose the pushrods and rockers, and also to provide some form of constant lubrication, and these were sold as the G.T. (Geoffrey Taylor, London Road, Kingston), Jarvis, Inglis and B.E.W. (Brooklands Engineering Works, Cobham), similar kits also being available for the motor cycle, which was of similar design. In 1923, the remaining stocks were used up as far as possible, and it is unlikely that further materials were required. A revised engine was, however, offered, incorporating cast-iron instead of steel cylinders, and a four-seater body was also offered, this being constructed by Comptons, the local coachbuilder who also made bodywork for some of Gordon England's cars. One such body was that used on his 200-mile-race car for the 1922 season, a photo of which appears in Boddy's The History of Brooklands Motor Course. In 1922, this car averaged 74 m.p.h., with a best lap of 86 m.p.h., to finish seventh out of 18 cars, the following year being fitted with a Bristol Cherub engine and finishing fourth, with an average speed of just under 70 m.p.h. What happened to this car after 1923 is entirely unknown. The Company proposed a pay decrease in 1922 which the unions rejected, after which many workers were laid off. In 1923 short time came into being with two weeks on and one week off, leading to one week on and two weeks off. Few could survive on such a precarious living and the company was wound up in July of that year. By December 1923, consent had been given to the registration of a new company, ABC Motors Ltd., with T A Dennis as Managing Director, who from 1915 had been the Secretary of the Company. Any stocks remaining were taken over, the new factory sold and all work reverted to the Old Esher Road factory across the way from which several more cars were assembled and sold at £160 for the Sports, £175 for the Standard, and £185 for the four-seater. The term ‘Standard’ also appears to have been dropped shortly afterwards in favour of a reversion to the ‘Regent’ name, which poses the question as to where these bodies were made. It is likely that a new batch of cast iron cylinders were made from about 1924 instead of the machined steel ones and these were also made in larger format for the new Supersports model introduced late in that year (91.5 x 96.1mm giving a capacity of 1326cc). The new Supersports was fitted with a two-seater polished aluminium body with pointed tail, staggered seating and V-screen made by Compton & Hermon, the local coachbuilders. The engine had a larger crankshaft with double roller big-ends and the valve rocker mechanism was redesigned with larger bearing surfaces for the pushrods, both pushrods and rockers being enclosed to aid lubrication, somewhat on the lines of the Taylor Young valve conversion set on the ABC motorcycle. An oil tank mounted below the subframe supplied lubrication to twin adjustable sight feed indicators on the dashboard, with a recommendation to deliver 60 drops per minute to each cylinder. Helically cut timing wheels replaced straight cut type and twin Zenith triple diffuser carburettors were fitted. Each cylinder had its own silencer and exhaust pipe, finished off with about one foot of copper pipe, which gave a certain resounding ring when in use and not especially favoured by horses. Fifty of these larger engines were made. Some could have gone into standard cars and eight went for scrap after WW2, leaving a maximum of 42 built. Five of them appeared on the 1927 London – Lands End Trial organised by the Motor Cycling Club, perhaps the largest number ever seen together. The body was similar to Gordon England's 200-mile-race car, with staggered seats and pointed tail, and was built by the same coachbuilder, but incorporated a vee screen, a small door, and a triangular boot which contained the spare wheel. Raked mudguards were fitted to add to the car's sporting looks, and all the bodywork was finished in polished aluminium. Shock absorbers were fitted as standard, and most cars retained disc wheels, although at least one had Rudge-Whitworth wire wheels, which were somewhat lighter, these having either 710 mm. x 90 mm. cord, or 715 mm. x 115 mm. cushion tyres. In its standard form the Supersports sold for £275, which compared quite favourably with offerings from other manufacturers selling this type of vehicle, but although the A.B.C. had very good acceleration, its top speed was only 65 m.p.h., so would not appeal to anyone who had a view to any serious competition. The first of these cars, possibly a prototype, was constructed for a South African enthusiast who ordered many extra improvements which in all pushed up the price to nearly double the original. Shortly before it was to be delivered, the customer died, and this car was used by T. A. Dennis as the works car (Reg. No. PD 4837), and as such was frequently seen in and around Hersham. In the course of the next two or three years 42 of these cars were sold, although at no time was it exhibited at a motor show, the company now tending to concentrate once again on aero engines, and building cars almost as a hobby. Some experimenting was apparently undertaken with the fitting of a water-cooled Anzani engine, and also with a Scorpion Mk. II aero engine of 1,500 c.c., but neither were adopted, and the car finally faded away about 1927. Gordon England’s first attempt at a sporting body on his 200-Mile Race car. Aluminium is thumb turned, coachwork by Compton & Hermon. Wire wheels make the car far more attractive and slightly staggered seats can be seen, together with a fair sized under tray. In all about 1500 ABC cars were built between late 1920 and 1927. Some previous references have given the terminating date of production as 1929, but this is thought to refer to the final dissolution of ABC Motors (1920) Limited as reported in the London Gazette of April 9th that year. About ten examples survive, half of which are outside the UK, whilst there are one or two much modified ‘specials’, some just incorporating ABC engines. For both general use and for constant speed racing or even sprints, the ABC engine seemed reasonably robust, but what it was poor at was track racing where gear shifting was constantly required. Engines had a habit of suffering when sudden high revs were required when changing down gears, causing failure of con-rods or crankshafts. Several engines have failed in more modern ‘specials’ for just such reasons, which means that there are now few ‘spare’ engines about.